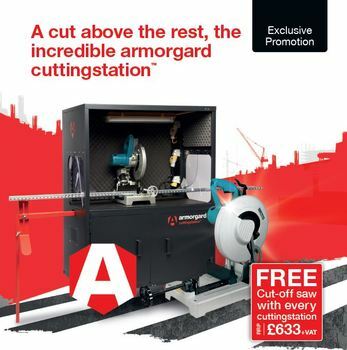 This unique multi-purpose cuttingstation™ from armorgard is a cut above the rest. Receive a FREE Makita LC1230 cut-off saw with every cuttingstation™ ordered between 24th July and 31st August 2017. Claim yours today while stocks last! The armorgard cuttingstation™ is a unique purpose-built work station for cutting lengths of metal, such as conduit, cable tray and pipe. Integral health and safety features include fire-rated sound deadening foam to reduce noise pollution, and PVC screens to contain and protect from sparks. The chop saw is positioned on a rubber mat to reduce vibration, while the innovative design allows the chop saw to be positioned at a safe working height, minimising risk of accident or injury. Click here to view the T&C's of this promotion.